On the Green Inside and Out radio show this evening I discussed one of my favorite examples of one of the permaculture principles, "design from patterns to details." Engineers in Tokyo revamped the rail lines from Tokyo to its surrounding cities to make it more efficient. Some researchers wanted to test the efficiency of those routes and did so by transposing a scaled down version of the map onto a growth medium. 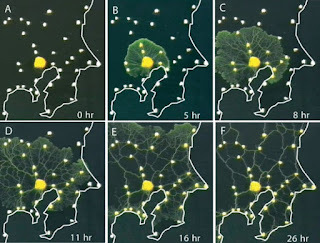 A slime mold (type of fungus) was placed in the center of the medium, corresponding to where Tokyo would be. 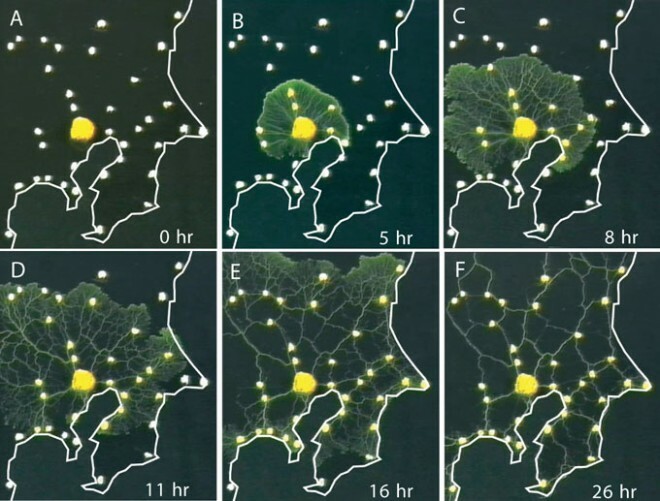 Oat flakes, a nutrient source for slime molds, were placed on the medium, scaled to correspond to the cities that surround Tokyo. The slime mold grew towards the oat flakes in order to feed off of them and over time funneled into the most direct and efficient paths towards their nutrient source. When compared to the most efficient routes that they engineers came up with they were found to be comparable. This is one example of the ways in which biomimicry, and the concept of designing from patterns to details, can be used in smart growth design. As global population increases our cities will become more crowded and with that growth will come challenges in design. The slime mold experiment is a low-tech and time efficient tool to map out potential navigation routes. The larger point here, though, is that we have so much to gain from tapping into the wisdom of the natural world. The more we can identify patterns in nature the better we will be able to design. The more place-based we can make those patterns, the more we will be able to customize design for specific geographic areas. For a more in-depth read on the Tokyo slime mold experiment, see this 2010 Wired article. As a follow-up read, this Guardian article from 2014 further explores the ways in which studying slime molds in mapping can provide us with efficient design ideas for different sectors of society. It discusses some of the gaps in our understanding of slime molds' behaviors, especially around the concepts of anticipatory behaviors and intelligence. Baby kale, arugula, chive flower blossoms. All organically grown in my garden. Nom nom nom. Dandelions, despite public perception, are a wonderful plant to have in your yard. From an ecological perspective they are important as an early source of nutrients for honey bees for starters, among other things. The leaves are quite good when harvested early in the spring, before the flowers bloom. They can be sauteed with garlic in some olive oil and served with eggs for a delicious breakfast. Dandelions offer vitamins C, K and A, and are a great source of calcium, potassium and fiber. I really love the concept of embracing the gifts that nature offers at different times of the year. Early in the spring the first glimpses of life emerging from the ground are always a welcome sight. I think that using some of the dandelions in your yard to feed your family is a great way to ackowledge and show appreciation for the nutrients that the earth offers up early in the season. I don't really understand the vendetta against dandelions that so many people seem to have. This was my first shot at making this bread recipe that I came up with but it turned out great and was a hit with my family so I figured I would share the recipe. It's a great breakfast bread because it's filling. You can fry up an egg and plop it down on a piece of this toast without seasoning it because the bread has such great flavor. You can obviously adjust the spice blend to your liking. I'm sure adding some paprika, chopped garlic, etc could work really well. I think the most important aspect of baking or cooking is to enjoy what you are doing. It's interesting to consider the idea that you are energizing this food as you create it, and it makes you more mindful of your attitude and thoughts while cooking for loved ones. Combine dry ingredients and mix thoroughly. Add the water, being careful to not overwork the dough. Cover it overnight. The next day pre-heat the oven to 425 degrees. Put the dough on a floured surface and mold it into a disc shape. Thoroughly cover the dough with flour and place it in an oven proof dish. Cover the bread for the first 30 min with a lid and then uncover it for the last 15 min of baking. The outside should be perfectly browned, while the inside remains moist and chewy. I recommend having a slice before the bread cools because that is when it is best! Baking times may vary based on altitude and oven type. The addition of oat bran significantly changes the texture, making it less airy and more dense, but still quite satisfying! Sunday was such a beautiful day I'm glad I was able to get outside and enjoy the day. Planting Fields Arboretum is starting to wake up from the long winter. Their greenhouses appear to have been awake for some time though. I don't know of a therapy better than walking through a warm greenhouse awash with floral fragrances. The warm and humid air revitalizes your skin and the air seems so clean that with every inhalation I feel it nourish my insides and every exhalation seems to expel stale and stagnant energy from my cells. I adore orchids. I love knowing that for every orchid there is a specific species of bee that has co-evolved with it. I love how intricate nature is. I am so grateful for all of this beauty and life. Spring brings such a strong feeling of hope and renewal. I am always glad for its arrival, especially after a long and cold winter like the one we just had on the east coast. It's officially summer! My garden is gaining momentum and I have enjoyed watching it slowly become more and more jungle-like. Some of the first plants to mature (aside from my beloved radishes, that is!) were the nasturtiums. I love them because they are incredibly intricately beautiful and they are edible! Nasturtiums contain vitamin C, iron, and anthocyanins (flavonoids with strong antioxidant properties). If you are serving a salad it looks very fancy to put a few of these beauties on top. The leaves of nasturtiums are also edible, but are significantly more peppery than their flower counter-parts. I made a potato salad for the potluck with organic potatoes because according to the studies that produced the Environmental Working Group's Dirty Dozen List, even after being washed potatoes contain more pesticides than any other vegetable by weight. I know buying everything organic can sometimes be a challenge so I think the guide that EWG provides does a great job in helping consumers to prioritize what fruits/veggies are most important. I love having an herb garden because it has so many benefits: it attracts bees and butterflies, smells great, helps to keep away predatory insects, they taste great, and they have lots of phytonutrients and antioxidants that keep me healthy. I added some minced mint, as well as chives and dill to the potato salad. I love working on a recipe, and realizing I need a bit more of a certain ingredient, and being able to get what I need from my backyard garden. It is such a great feeling! Mix together the potatoes, celery and red onion. Add the mayo and yogurt. Mix in the spices and herbs and you're good to go! Today when I was serving leftovers for lunch I mixed a couple of hard-boiled eggs into the potato salad, which complemented it nicely. I served that over a bed of buttercrunch lettuce (picked from my garden) mixed with clover and chickweed that I foraged from outside, as well as a dash of Greek feta vinaigrette. Mmmm mmmm good.